In the five days since my last workout, the pain in my right wrist has persisted. It's more than just sore, and I'm beginning to suspect that I may have mildly (or not-so-mildly) sprained it. I can't do push-ups with my right hand flat against the floor -- though I can do 'em fine with my hands balled into fists. It hurts to clean a barbell right now, and I can't throw or catch a medicine ball worth a damn. Still, I was itching to get in the gym and get sweaty, and figured there was other stuff I could do. Like pull-ups. And renegade rows. And dumbbell snatches. And double-unders. It turns out I could do all of today's movements (though I scaled down the weight of the dumbbells in the metcon). 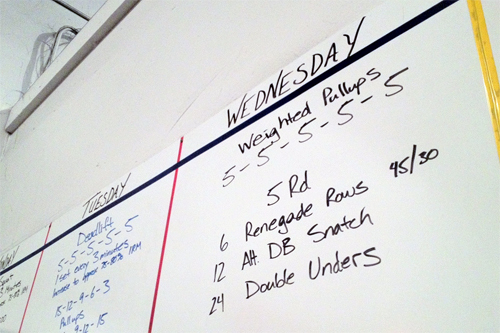 We did one set of 5 weighted pull-ups every three minutes, which was a great way to keep us moving and in the groove. And the metcon was nice and fast; I got through everything without pausing (except to disentangle myself from the jump rope a few times). Result: 8:09. Or 8:15. I think. Oh, hell. I think my brain's melting.